This is the final and most important Key of all. Without loving yourself, you can never truly have emotional freedom. If I asked you “Do you love yourself?” your answer would probably be “Of course I do”. In fact, you may wonder why I’d even consider asking the question – doesn’t everyone love herself or himself? Yet while you say you love yourself, how do you show it? Are you kind to yourself? Do you take time for yourself – sacred time that’s only for you? Do you have a sacred space for yourself that’s decorated the way you want it decorated where you can go to find comfort and relaxation? Do you set boundaries for your life that let other people know how you expect to be treated? If someone crosses your boundaries, do you ignore it or do you confront them and, with love and grace, tell them how you expect to be treated? When things go wrong, do you wallow in self-pity -- or do you pick yourself up, dust yourself off, and continue on because you know life will get better. When you make a mistake, do you berate yourself and tell yourself that you never get it right – or do you shower yourself with forgiveness because you know you’ll do better the next time? How’s your health? Are you a junk food junkie--Do you eat a diet high in sugar and starch or do you eat healthy foods to fuel your body? Are your meals eaten mindlessly, in a rush – or are they eaten leisurely, in a calm, pleasant atmosphere where you can be conscious of your food and what it tastes like? Do you spend your leisure time slouched in front of the television watching the latest reality show or do you spend quality time interacting with family and friends? Do you get 8 hours of sleep at night, or do you short-change yourself hoping to make up for lost sleep during the weekend? You might think that self-love is automatic, but it’s not. Step back for a moment and take stock of your life. Be conscious of how you spend your time and how you treat yourself and others. Be aware of yourself and your life. 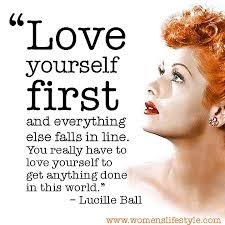 And, above all, Love Yourself.